러시아 중앙은행으로부터 하이페리온골드가 첫 수입한 제품입니다. 그러나 박스(포장박스)는 되어있지 않고 캡슐링만 되어서 제공되는 상품입니다. on the mirror field of the disc the relief image of the National Coat of Arms of the Russian Federation, over it along the rim the semicircular inscription "РОССИЙСКАЯ ФЕДЕРАЦИЯ" (RUSSIAN FEDERATION), framed on both sides by doubled rhombuses, below under the coat of arms: to the left indications of the precious metal and its fineness, to the right the fine metal content and the mint trade mark, at the bottom in the centre in three lines the inscription "БАНК РОССИИ" (BANK OF RUSSIA), the denomination of the coin "3 РУБЛЯ" (3 RUBLES), the year of issue "2017 г." (2017). 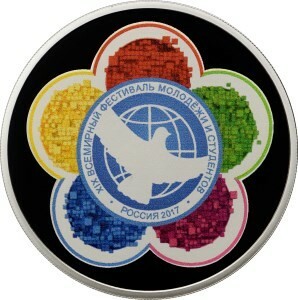 on the mirror field of the disc the colour image of the official logo of the XIX World Festival of Youth and Students 2017. The artists: E.V. Kramskaya (obverse), A.D. Schablykin (reverse). The sculptors: A.A. Dolgopolova (obverse), computer simulation (reverse). 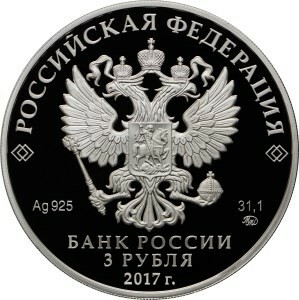 Mint: Moscow Mint (MМД). The edge: 300 corrugations.